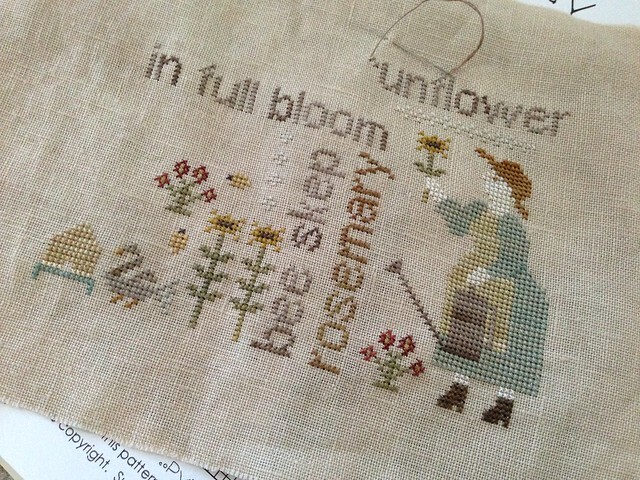 Nicole's Needlework: I got a Job (almost)! I got a Job (almost)! I'm sure you all have noticed that I made my blog private (I have decided to reopen my blog as of 10/29/13). I made that decision because I was in the process of getting job (which I have now gotten). I have been stitching and knitting a little bit. 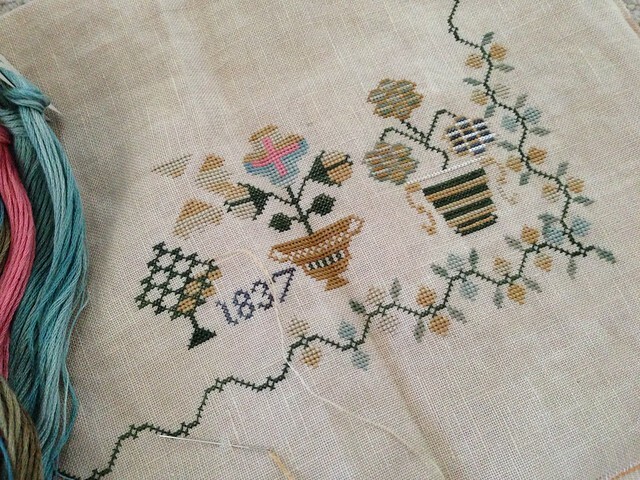 I started Paulette's 1837 Crown Sampler using Katrina's conversion a few weeks ago. And I have been slowly working on August Word Play (we'll see if I can finish before October). I have also been knitting dishcloths and socks. Only the socks haven't quite been working out. I have been mainly ripping. I did finish one, but it was a little tight. In other news... I found a knitting and stitching group near me. It has been so nice to meet up with people nearby! Well, hopefully, it won't take me so long to update again (I've been saying that a lot lately). That conversion is really pretty, and your colorful knitting is, too! Love your dishcloths. The colors are fab. Of course your stitching is lovely as always. I really, really like the wordplay pieces. This one is particularly adorable. Hugs dear friend. Thanks for the invite. Love your start on the Crown Sampler, waiting for my v.light examplar. Good luck with the new job! I am sure you'll do great. No reason to be worried. Great start on the Crown Sampler and your dishclothes are so colorful Very cheerful to look at. Your Word Play is really coming along nicely as well! Congrats on the new job, Nicole! Great start on the crown sampler and Word Play is adorable! Love the gal with the watering can. The dish clothes you're knitting are great -awesome colors. Almost too pretty to use but then again, the make a yuck job a lot more fun! Congratulations on the new job! Working for a police department should be pretty interesting! 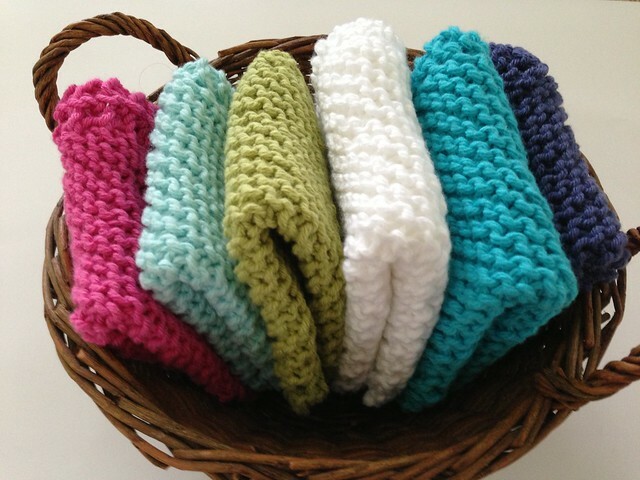 Love the basket of hand knit dishcloths! Of course, your stitching is always gorgeous. Everything is just so pretty, love those dish clothes!!!! Congrats on the new job, you will do great :-). Love your colors on the Crown Sampler. So soft! Beautiful work, as always. Love the sampler and the conversion. Congratulations on your new job and and deepest thanks for inviting me to be a reader! Thanks for the invite :) Sounds like it will be an interesting job. Working for the police must be exciting. Love all the stitching and knitting!!!! Congratulations on your new job! Your stitching is beautiful as always! Love the colour conversion on the crown sampler. Each time I see the knitted dishclothes I think of my favourite aunt - she is 89 and is still able to knit them.